Strong product outlook owing to increasing use of harvesters and tractors, curbing labor forceful work and higher productivity will drive the demand for the industry. Implementation of IoT as well as advanced methods such as GNSS system and precision farming will further boost the business growth. Periodic labor shortage along with growing use of autonomous devices, which provides better efficiency and higher productivity will increase the implementation of autonomous farm equipment. Technological innovation along with development of auto driving and self-steering systems in tractors will supportively influence the penetration of equipment. Increasing startups concentrating majorly on robotics uses in agriculture and decrease of complete operational costs of agricultural processes and growing yield will increase product use in the industry. Additionally, the device can work in extreme weather settings dipping the working time and improving profitability. Persistence Market Research has created a report offering a comprehensive market analysis with the support of inputs from industry professionals, by ensuring significant and robust information, with the help of effective trial design and endpoint valuation. This report is an all-inclusive study concerning current trends in the farm equipment market, advanced technology, industry growth boosters and limitations. The report additionally delivers market estimate for the upcoming years. Report is inclusive of a valuation of macro & micro aspects vital for the predominant market players along with new entrants and detailed value chain study. The report covers existing scenario and growth forecasts of global autonomous farm equipment market for 2017-2026 period. The report comprises of many chapters that delivers precise data vis-à-vis the expansion of global market for autonomous farm equipment, for the estimated period. An exclusive outline condenses the noteworthy highpoints from the extensive research report and offers them systematically, in order to unveil primary segments, unaffected markets and profitable growth opportunities. The report in addition analyzes the changing facades of the global autonomous farm equipment market. In this unit, attributes that are likely to boost and restrain the sales of autonomous farm equipment have also been analyzed. Revenues from primary autonomous farm equipment companies have been discovered to bring standards for assessing the revenue development of the global market. The report has furthermore gauged the global autonomous farm equipment supply chain and has presented the remarkable machine type sourcing processes executed by the market players. The report offers a thorough information on the dealer landscape together with resultant analysis associated with prominent dealers in the global autonomous farm equipment market. The dealer landscape includes study on main vendors as well as competitive executions concerning their portfolios. The report also shells the landscape of global autonomous farm equipment market and its predictions for growth in the approaching years. The report takes in ideas exchanged amongst the key dealers and market analysts working in this market. Besides, this report delivers a visual, easily pilotable platform, by means of which, the client can estimate the value of their & competitive products. The report will also help the market players in producing facts and positioning tactics for transformation & value optimization in an increasingly competitive market. Automation of farm equipment provide several advantages such as precise and fast operations, incessant operation, regardless of the climatic conditions and time, as well as long-term resolutions for heavy and complex operations such as harvest and plow. Autonomous farm equipment help in saving cost and time involved in the yielding compared to standard farm equipment, thereby making this advanced equipment a preferable choice for farming procedures. Technology is developing incessantly and the manufacturers are focusing on introducing new and advanced types of autonomous equipment. Nevertheless, the method of producing autonomous farm equipment is yet in its emerging phases and the price of existing autonomous farm equipment is quite overgenerous. As a result, the aforementioned issues is likely to affect the development of the global autonomous farm equipment market. Leading manufacturers are involved in developing cutting-edge autonomous farm equipment for increasing reliability and efficiency by reducing their costs. Besides, the notable production of advanced robotics and electronics together with navigation and GPS systems are creating fully autonomous farm equipment efficient and more precise. Extensive usage of tractors as well as combine harvesters induced with auto steering and rise in usage of drones attributes to the large revenue generation of the global market. High costs related to autonomous farm equipment along with training time essential for learning regarding the usage of autonomous equipment is likely to hinder the development of autonomous farm equipment industry. However, foremost companies are working towards introducing cost-efficient and effective equipment, due to which, market for autonomous farm equipment is set to exhibit a noteworthy headway in the review period of 2017-2026. As per latest report by Persistence Market Research, the global market for autonomous farm equipment is poised to expand at an outstanding 13.6% CAGR during the forecast period, 2017-2026. The report gauges that by 2026-end, nearly US$ 16, 9691.5 Mn worth of autonomous farm equipment will be sold across the world. The report furthermore expects that APEJ will be spearheading the global autonomous farm equipment market, in terms of revenue. Drones or UAV (unmanned aerial vehicles) are projected to bring about a creditable increase in the autonomous farm equipment industry. There is increase in the usage of technologically advanced drones for the purpose of health and irrigation valuation of crops, crop monitoring and spraying, planting and field & soil analysis. Drones can reach out to any position of the field swiftly and can effectually recognize problems and breakthrough solutions as and when incorporated by means of scanners, thermal sensors, cameras, ultra-sonic echo machines, 3D maps, through which, demand for the product is increasing considerably. Autonomous tractors utilize a lot of advanced systems and sensors that an efficient self-driving vehicle would possess. In countries such as the U.S., autonomous tractors hold auto-steering systems which provides superior control even in the low-visibility conditions. By executing these advanced structures in run-of-the-mill farming, farmers can experience the influence of tech in work. Autonomous tractors can additionally be set up for serving as mobile hotspots, in order to collect data from the sensors that are located all over the field. It provides help for accurate agriculture applications by delivering swift information vis-à-vis a wide array of factors, which are likely to affect the growing operations. The key players leading global autonomous market have been outlined by the market analysts in the report. They include Bobcat (a Doosan company), Claas KGaA GmbH, Kubota, Deutz Fahr, Yanmar, Iseki & Co., AGCO Corporation, John Deere, Case IH, and New Holland. Some of these firms are probable to deal with challenges by means of development of cost-efficient equipment and advanced techniques in farming. 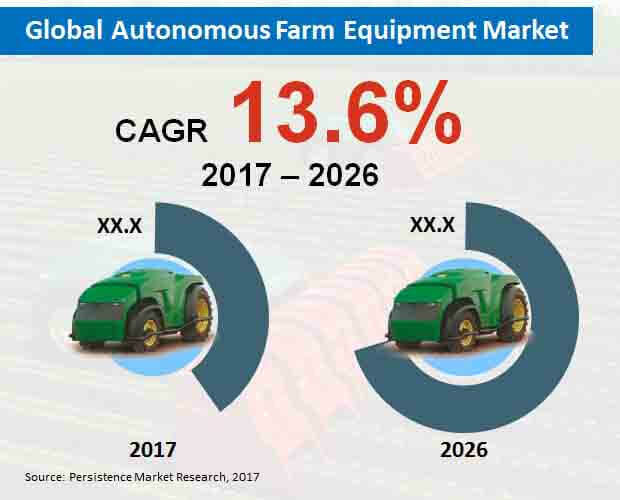 Moreover, reduction in the manufacturing costs and rising profit margins is expected to be a key focus zone for players in global autonomous farm equipment market.